Summary, Analysis, and Review of Amor Towles's A Gentleman in Moscow PLEASE NOTE: This is a key takeaways and analysis of the book and NOT the original book. 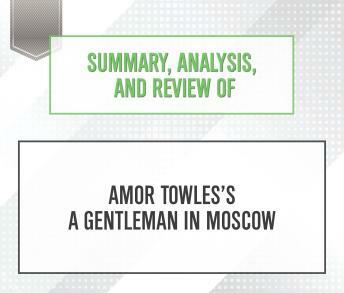 Start Publishing Notes' Summary, Analysis, and Review of Amor Towles's A Gentleman in Moscow: A Novel includes a summary of the book, review, analysis & key takeaways, and detailed About the Author section. PREVIEW: A Gentleman in Moscow is a novel about Count Alexander Ilyich Rostov, a Russian aristocrat who is condemned by Communists to spend the rest of his life confined in the Metropol, the capital's most glamorous hotel. The story opens on his trial in 1922, where he's shown leniency as a reward for having written a revolutionary poem that pre-dated the Russian Revolution. The only catch? If Rostov ever leaves the hotel, he will be executed. The novel unfolds over the course of the thirty-two years that Rostov spends under house arrest.